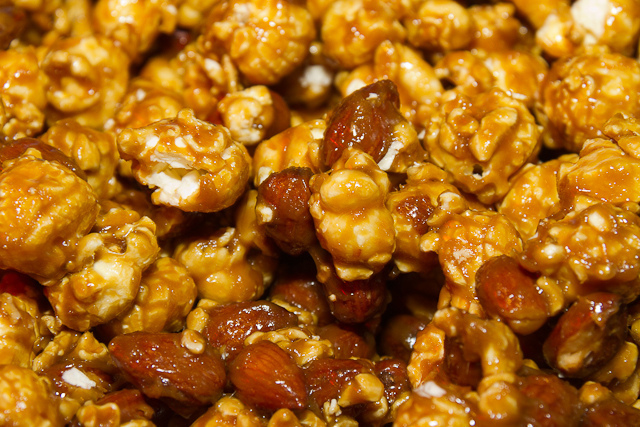 (Tin3) Create a Tin with only Pecan, Cashew or Almond Caramel Popcorn. Select 1, 2 or 3 flavors. Home > Create a Tin > (Tin3) Create a Tin with only Pecan, Cashew or Almond Caramel Popcorn. Select 1, 2 or 3 flavors. 1 gallon Tin select up to 2 flavors. 2 gallon, 3.5 gallon and 6.5 gallon Tins select up to 3 flavors. Customize your Tin with a variety of flavors. Choose up to 2-3 flavors per Tin. (Tin.5) Create a Tin with one half of tin (Pecan, Cashew or Almond Caramel Popcorn) and one half FROM OTHER FLAVORS LIST. Select 2 flavors. (Tin1) CREATE A TIN WITH 1/3 of tin (PECAN, CASHEW OR ALMOND CARAMEL POPCORN) AND 2/3 OF TIN FROM OTHER FLAVORS LIST. Select 2 or 3 flavors. (Tin2) CREATE A TIN WITH 2/3 OF TIN (PECAN, CASHEW OR ALMOND CARAMEL POPCORN) AND 1/3 OF TIN FROM OTHER FLAVORS LIST. Select 2 or 3 flavors.